A list to fulfill all your ska-punk needs. Hailing from the land of surf rock, Southern California band Tunnel Vision are the product of their native land. 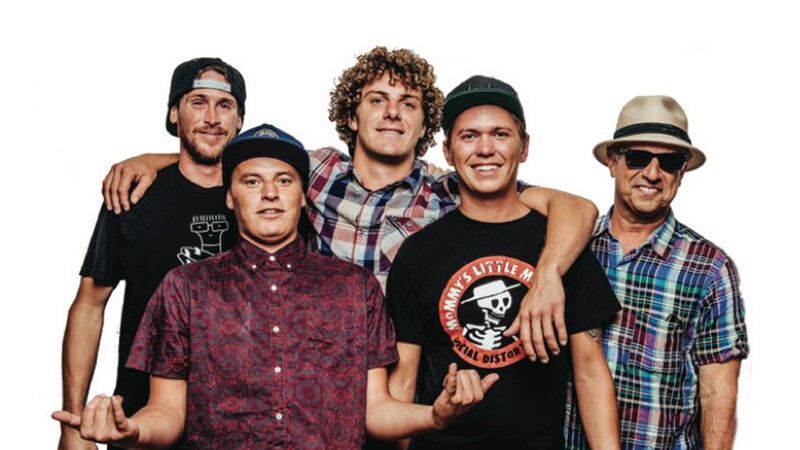 Each group member is an avid boarder, so it only makes sense that the quintet practice the lifestyle that they preach in songs like "Skateboard" and "Liquid Fun". Performing everywhere from surf contests to outdoor venues to shows on the summit of Mount Kilimanjaro (no seriously)—the band is no stranger to life on the road. Despite the group’s consistent touring habits (their currently on a run with Reel Big Fish), the guys still find time to check out other musician's sets from the crowd. We found out what the "Tides" creators all-time favorite bands to see live are, and yes, it's a ska-punk dream. Check out their Top 10 below—listed in no particular order—then make sure to Track Tunnel Vision on Bandsintown to see when they'll be bringing their tour to in a city near you! "Not just saying this because we are touring with them. They're one of my all-time favorites and seeing them live made me like them even more. Stoked to share the road with these legends." "Awesome every time you see them. You never know what you’re gonna get. Fat Mike can get a bit sloppy sometimes, but between Smelly's insane drumming and El Hefe's impersonations, it all makes up for it." "Unreal!! Descendents are my (Hayden) personal favorite of all time. A classic band that started up in the original punk rock scene that will still rock your socks off." "Super exciting visuals. Insane horn section. Enjoyed watching the trombone player jump off the stage, running around throwing toilet paper on everyone. The guys get crazy." "Always on point. Always great. One of the best live bands out there and the nicest guys on the planet. They have helped us so much through the years. Big ups to those guys. Much love." "They surf!! And they rip! We've surfed with them and their show is always insane. Raul you are a beast on the guitar. Adam's and Geoff's harmonies are killer." "One of the most energetic sets you will ever see. Mark is one of the best frontmen. He will literally pick you out of the crowd and roast you over the PA if you’re not skanking your heart out with the rest of the crowd. Comedic as hell, as well." "One of our favorites. We all have a big soft spot for Everclear. We Usually end up all drunk singing every word to these guys on a regular basis and live, they're impeccable." "One of the most visually stimulating shows you will ever see. If you get a chance to see these English legends. F#*^ing go. Confetti cannons, streamers, giant beach balls. They got it all and Monkey will be wearing something very shiny." "Actually got to see them with the Adicts a few weeks ago. Which I thought would never happen because there nothing alike musically, but always rad instruments come out randomly violins, organs, horns and just a really amazing set."